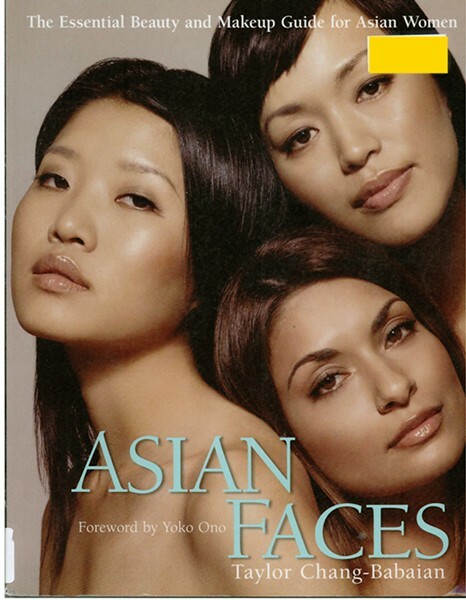 Its not often that I spot a makeup book addressing Asian eyes, nevermind Asian faces in general but this is exactly what this book ASIAN FACES is all about. Written by Taylor Chang-Babaian, she aims to address makeup looks specifically for Asian features; including eyes, face shapes, lips the whole package. Want to know my thoughts on the book and how it measures up? With the scarcity of makeup books written in English for an Asian Market out there, this books actually isn't too bad. 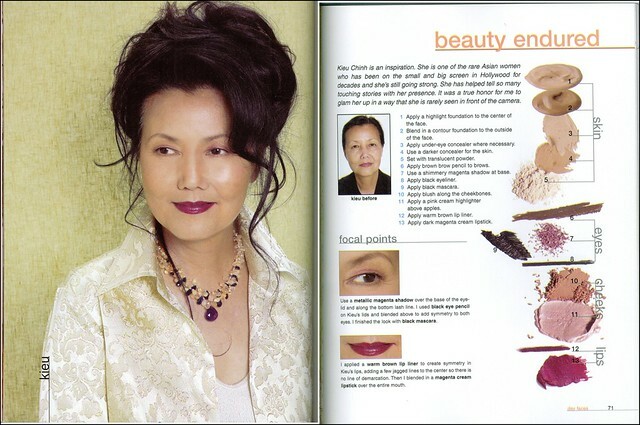 It contains many wearable looks that compliment Asian features. Above all, I enjoy that she doesn't limit "Asian" to being Chinese/Japanese/Korean....but rather she includes a couple of Indian models as well. For me, her "Decades Section" really stands out and shows off her talent as a makeup artist. The variety of looks and techniques are certainly well showcased as can be seen by the attention to detail and the understanding of the period. Yet its with some of the technicalities of the book that I find takes away from its full potential. Here are some scans from the books. So you can take a look at the layout and get a feel for it. 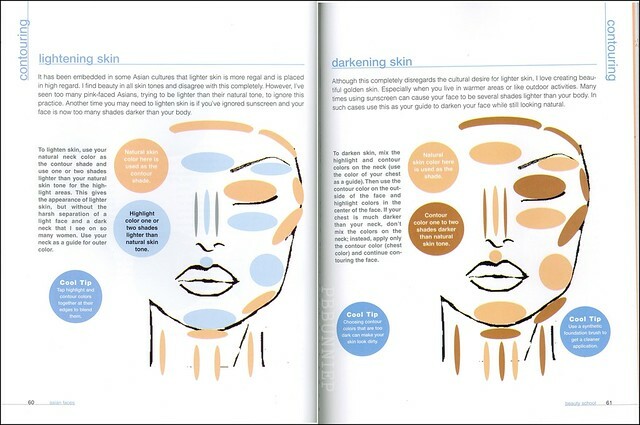 First is the contouring page that I showed in the video, I'd say this is one of the best contributions of the book as she talks about both lightening the skin and darkening it. The rule here is not to make the face flat with a darker/lighter foundation but still retain contours and shape to the features. I may try it out sometime and see how it turns out. The following are some looks featured in the book. This look is very well done and at the same time, very Asian in colour choices also. Its the kind of makeup that my mother would like to wear if she wore makeup. Here's a look done on monolid eyes, though I must say her monolids are better shaped than mine. Mine tends to droop down and as a results makes me look tired all the time, her's are definitely more rounded and open. However, its with these types of looks that I find it very difficult to follow as she doesn't include clear steps or closed eye shots. A more dramatic, evening type of look with a smokey eye and glossy lips. Overall, a good one to flip through in the library but not great enough for me to buy and keep on my shelf. I think that once you get over the basics of makeup, this book won't be enough to keep your attention for long as it does seem to lack variety. Better illustrations and clearly pictures would certainly have benefited this book. Thank you so much for the scans! Makes me want to go and purchase the whole book! You are welcome. I'm glad that you found it helpful!